A host of upsets and some brotherly results were featured on Sunday, Day 2 at the 68th USTA Florida “Bobby Curtis” Junior State Doubles Championships as the majority of age divisions were drawn down to the finals. The “Bobby Doubles” is held Sept. 17-19, 2016, at Sanlando Park in Altamonte Springs (18s-16s age divisions), and at the Florida Tennis Center in Daytona Beach (14s-12s divisions). The Boys’ 18s doubles quarters was an all-unseeded affair, and the resulting all-unseeded final will see last year’s Boys’ 16s winners, twins Harry and Grey Cacciatore (Gainesville), against Daniel Gale (Boca Raton) and Antonio Mora (Coconut Grove). Mora is also into the Mixed 18s final. Another pair of brothers, Max and Martin Damm (Bradenton), sons of former doubles Grand Slam winner Martin Damm, made it all the way to the Boy’s 16s semifinals as an unseeded pair before being edged 10-7 in the fifth set by David Burns (Fleming Island) and Daniel Labrador (Tampa). In the Boys’ 16s final, the No. 5-seeded Burns-Labrador will face the unseeded pair of Juan Bianchi (Ocoee) and David Gorshein (Longwood). In the Girls’ 18s draw the No. 1, 2, 3 and 5 seeds went through to the quarters, and the Girls’ 16s final will see No. 6 seeds Ayshe Can (Weston) and Melanie Dlugolecki (Hallandale Beach) against the unseeded pair of Maria Rizzolo (Jupiter) and Sofia Rojas (Sarasota) after the No. 1, 2 and 4 seeds exited in the quarterfinals. Dlugolecki is also into the Mixed 16s final. The seeds held more firmly in the lower-aged divisions, as the Top 4 seeds advanced to the Girls’ 14s doubles semis, and the Top 2 seeds to the final — top-seeded Paige Herremans (Orlando)/Daniela Porges (Plantation) vs. Anna Babayan (Bradenton)/Sophia Fornaris (Pinecrest). 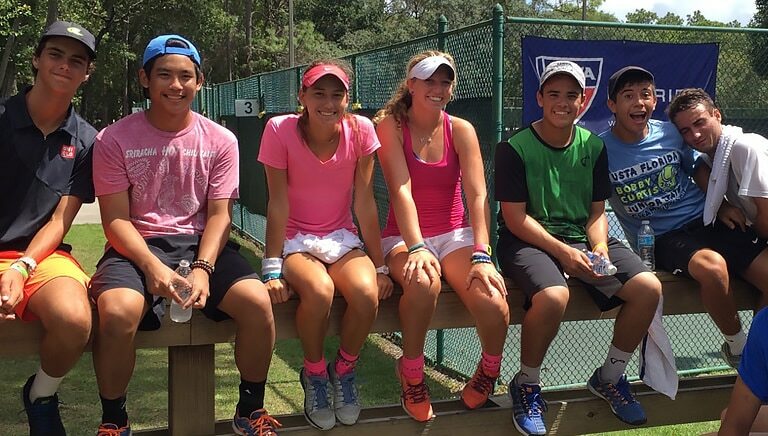 The 14s Jack Anthrop (Orlando) and Babayan are into both their doubles and mixed finals respectively. The Girls’ 12s final will also feature a No. 1 vs No. 2 — top-seeded Brooke Dugarte (Miami)/Violeta Martinez (Port Saint Lucie) vs. Jessica Buck (Tampa)/Lara Smejkal (Boca Raton). Dugarte is also into the Mixed 12s final. Former “Bobby Curtis” State Doubles winners include current two-time NCAA champ Danielle Collins (Girls’ 18s-2010, Mixed 12s-2005), former Florida State University stars Terrance and Terrell Whitehurst (Boys’ 18s-2012), and at the pro level former WTA doubles world No. 1-ranked and Wimbledon winner Corina Morariu (Girls’ 16s-1992, Girls’ 14s-1991) and former ATP player Wayne Odesnik (Boys’ 14s-1999). Former world No. 1s Chris Evert, Andy Roddick and Jim Courier are among the players that have raised trophies in singles at the USTA Florida “Bobby Curtis” Junior State Singles Championships, previously known as the USTA Florida Jr. State Closed. Florida’s top event was renamed to honor the legendary Florida junior tennis organizer Bobby Curtis in 2012. Results will be posted daily in the news section on the front of the USTA Florida website at www.ustaflorida.com. For complete age 12s and 14s draws, results and seedings, CLICK HERE. For complete 16s and 18s draws, results and seedings, CLICK HERE.